Meet your guide at our base on the Picton waterfront at 8.45am. After a quick safety briefing and form filling exercise, you launch from the Picton foreshore. 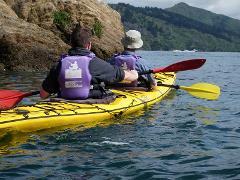 Paddling up the eastern foreshore of the harbour, you will quickly become familiar with the rhthym of sea kayaking. As you make your way into the Grove Arm of the Queen Charlotte Sound, you will pass bush clad shorelines that dominate the area. 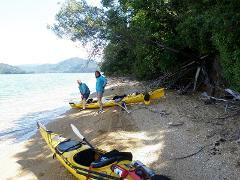 After an hour or so of relaxed paddling, it is time for morning tea on a secluded sandy beach. Feeling refreshed and invigorated, it is time to paddle across the Sound to the pristine shorelines of the western foreshore of the Grove Arm. Your guide enjoys sharing the fascinating history, wildlife and Maori legends of the area. We stop for lunch at one of the local bays, enjoying the peace and tranquility of this remote location. After lunch head down towards Anakiwa and home to the Outward Bound school, paddling past nesting cormorants and maybe a seal or two. Your day ends at Ngakuta Bay where you board a van for a 15 minute ride back to Picton, returning to our base at around 4.00pm. Departs daily, from 1 October to 30 April each year, subject to a minimum of two people. A winter option departing 10.00am returning 3.00pm is available from 1 May to 31 September each year. If you are travelling on your own please contact us, as others may already be booked on this trip. Trip must be pre-booked by 9.00pm on evening prior to day of departure, to ensure availability. Please phone trying to book on morning of departure. Yes, we can drop you straight to the ferry or bus terminal, if required. Can my children join the kayak trip? The minimum age for this trip is 14 years old. Families with younger children can be catered for upon request – please contact us directly.